We’ve just come back from Norway. We went to visit our friends Inger-Anne, Jan-Erik, Astrid and Ingeborg who live in Oslo. When we lived in Cairo, my daughter Lily and Astrid were great friends and when planning a surprise trip for Lily to celebrate the end of her exams, it seemed the obvious choice. I have visited Norway many years ago with my parents but that was a long time ago and I only had vague memories of the place. So we were delighted to arrive in Oslo to be met with glorious sunshine. We managed to get ourselves on a train to Skøyen where our friends lived. Norway is one of those countries where everyone seems to speak perfect English which makes life very easy for British travellers. It was incredibly easy to find our way around; the signs were in English and the dual-language announcements on the train meant there was no excuse to miss our stop. We arrived on a stunningly beautiful day and it seemed that every stunningly beautiful Oslo resident was out in the city’s green spaces or waterfront areas sunbathing, eating, drinking and generally having a whale of a time. Our hosts prepared us a lovely buffet lunch and then offered to take us out on their little boat for a quick water-tour of Oslo followed by coffee and cake at their little cabin on an island called Lindøya. It was a fairly easy decision! The little cabin turned out to be a picture-perfect wooden house with a large garden and a gorgeous sea view, 2 bedrooms, small kitchen, lounge complete with woodburner, shower room and a technological marvel known as an electric toilet. I honestly can’t remember the last time I was so impressed by a toilet. The coffee was top notch (as it always is in Norway I was to discover – no instant coffee granules in sight) and the cake was a pavlova covered with piles of fresh strawberries, raspberries and blueberries. Lindøya was originally an escape for the workers in 1920s Oslo who would row over to the island and spend the summer in tents to escape the poor air quality of their industrial working conditions. Eventually the city council allowed them to build wooden cabins on their plots and the structures have remained pretty much unchanged since that time. There are no cars or bicycles allowed on the island, cabins are not allowed to be expanded or changed outside the original footprints and many of the owners are now third generation family members of the original owners. It was truly a magical day topped off with a fantastic supper on the way home at a restaurant only accessible from the water where I had a local ‘fiskesuppe’ or fish soup with crusty white bread and a very cold glass of wine. Heaven. Another Norwegian speciality and a recipe I wanted to share with you is for ‘sour milk waffles’. It doesn’t sound too appealing but the sour milk is actually buttermilk whIch lends a great flavour and fluffy texture to the waffle and these are such a traditionally Norwegian thing to eat I had to share it with you. The other traditional Norwegian dishes I was looking at were lutefisk – which is white fish, often cod, which is dried and brined and then soaked in lye, which gives it a gelatinous texture. Or maybe hvalbiff which was on the menu at the restaurant we ate in, which was whale meat served with boat potatoes and steamed vegetables. So I thought the waffles would be best! The waffle mix smells lovely even before you cook it. 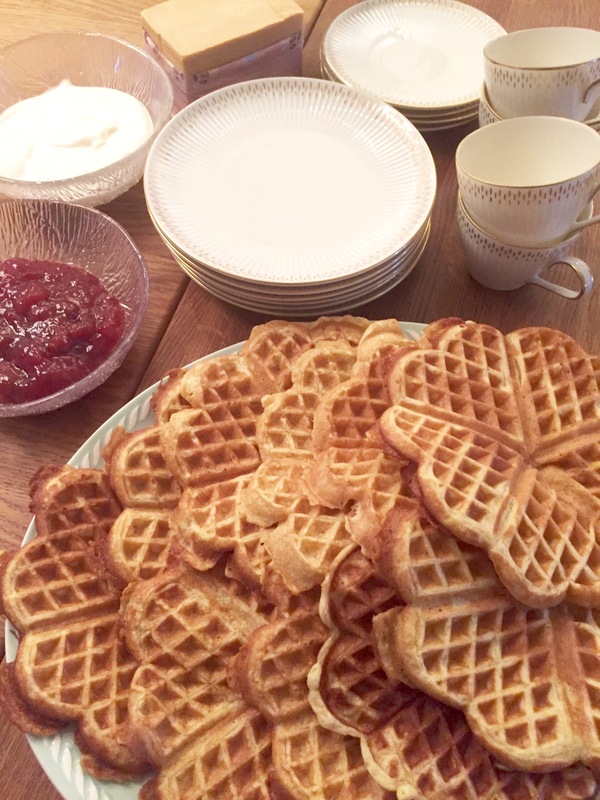 Inger-Anne says for her it is the smell of childhood as they used to have these waffles all the time for any school events, festivals or perhaps at as a teatime treat at home. Every Norwegian household has a waffle iron but these could be made in a frying pan so don’t let that stop you. Serve these waffles with butter, strawberry or raspberry jam and sour cream. Or to be really traditional you could try them with a bit of brunost – which is Norwegian brown cheese and is completely delicious. Made with cows or goats milk, it is a soft-set cheese sold in a block with the same sort of texture as Port Salut. It taste a lot better than it sounds, which a delicate and slightly caramel-sweet flavour. If you come to Norway you must try it! Served with coffee and always eaten with fingers, never a knife and fork, sharing and eating waffles is a big part of Norwegian food culture and one I was very happy to partake in. Have a go yourself for a brunch or teatime treat. Place the eggs and sugar in a mixing bowl and whisk lightly by hand until well combined together but not fluffy. Inger-Anne told me not to use a mixer for this. For waffles you must do it by hand. Add in the buttermilk, bicarbonate of soda and the melted butter and whisk to combine. Then add in the flour in stages, approximately a third at a time and whisk again to combine so it is fully incorporated without any lumps. You then must leave the mix aside for 30 minutes to develop before starting to cook it. To make the waffles, thoroughly pre-heat the waffle maker and brush with oil or cooking spray. If you don’t have a waffle iron these can of course be made in a frying pan like American pancakes or drop scones – you will miss out of the pretty pattern but the flavour will still be the same. Cook them for around 2 minutes on each side over a medium-high heat. Once both sides are golden brown you can take them out and rest on a wire rack briefly before serving warm and eating with butter, jam and sour cream.